“Local authorities must redouble their efforts to ensure that oral trials come into effect and are implemented as soon as possible and to prevent the risks associated with faulty implementation, such as the phenomenon of revolving force. In this situation, the criminal takes longer to reach the door than to leave through it precisely because of the shortcomings or faulty implementations of the reform,” he explained. He said that the Board of Coordination for the Implementation of Penal Justice provides advice as well as study programs for government officials responsible for implementing the reform at the local level. “At the same time, we are also strengthening and professionalizing our own security and justice institutions. To this end, we are evaluating, training and providing better equipment for the Federal Police and helping local authorities to make the same effort within the sphere of their competence,” he added. In the cupola of the Archivo General de la Nación, the President stressed that security and justice are matters that involve not only Federal Government but all Mexicans, which is why the implementation of this reform requires the surveillance, proposal and demands of citizens to make it successful. “Although a quality government requires quality institutions, it also requires citizens that participate, think, organize and demand and express themselves through the channels established by the law and the Constitution. I am convinced that institutions only improve when citizens appropriate and make them their own,” he added. 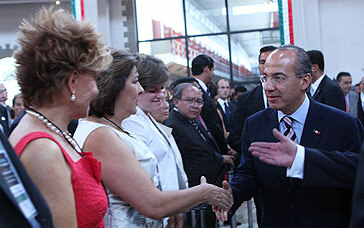 President Calderón urged Congress to pass the penal reform bills he will submit to to classify the crimes that have been commented on and have yet to be properly configured. “We want to close the legal loopholes that permit impunity in order to prevent dangerous criminals from walking out of prisons because of the shortcomings in penal typology,” he explained. Lastly, he made it quite clear that Federal Government will not cease its struggle against organized crime, since the aim is to restore the security and tranquility of Mexican families. That is why, he said, we must work together, because everyone’s future is at stake. “And I do not have the slightest doubt that it should be done. We must continue because this fight is worth it because it is naive to assume that if Federal Government withdraws, criminals will desist from their aim of taking over communities and the lives of every citizen, meaning that we must do so. And we must do so increasingly accurately and intensely. But we must do so and not cross our arms in this long-term struggle for Mexicans’ safety.